Tommy Armstrong comes up just short of the goal line on a 16-yard run. NEB: Abdullah, Ameer 23-146; Armstrong Jr., Tommy 10-55; Newby, Terrell 4-23; Cross, Imani 5-14; TEAM 2-minus 4. NWN: Jackson, Justin 22-128; Jones, Tony 1-8; Vault, Solomon 3-5; Green, Treyvon 1-2; Siemian, Trevor 7-minus 26. NEB: Armstrong Jr., Tommy 18-29-0-221; Pierson-El, D. 1-1-0-16. 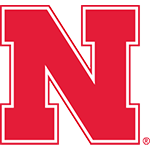 NEB: Bell, Kenny 5-89; Abdullah, Ameer 4-13; Pierson-El, D. 3-66; Westerkamp, J. 2-28; Newby, Terrell 2-1; Moore, Alonzo 1-18; Armstrong Jr., Tommy 1-16; Foster, Trey 1-6. NWN: Shuler, Miles 5-33; Jones, Tony 3-24; Prater, Kyle 3-21; Vitale, Dan 2-22; Dickerson, C. 2-21; Green, Treyvon 1-23; Buckley, S. 1-19; Vault, Solomon 1-10. Ameer Abdullah breaks free during the second half. Huskers Crush Cats in Second Half: Nebraska needed no Hail Mary this time. Instead, the Huskers got a dominant second-half defensive effort and a career-high four touchdowns from Ameer Abdullah in a 38-17 win at Ryan Field. After being outyarded 262-227 in the first half, the Huskers dominated the second half 244-28. Abdullah exploded for 107 yards and three scores on 14 totes after halftime. The Big Red closed the night with 234 rushing yards, including 55 by quarterback Tommy Armstrong Jr., who also passed for 221 yards and caught a 16-yard TD pass. 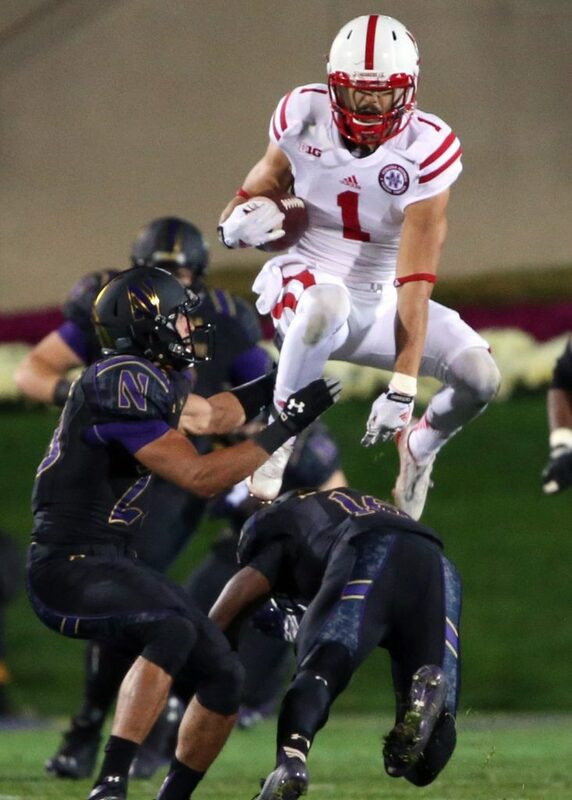 Jordan Westerkamp hurdles Godwin Igwebuike. The Huskers played the second half at a level befitting a top-15 squad. Pierson-El, all 5-foot-9, 175 pounds, gives the Huskers something to build around. Pierson-El is increasing his contributions, even when he isn’t touching the ball. The Huskers have championship talent in several places, but you wonder if the rest of the team will ever catch up. Garrison is developing some depth on the o-line after all. It will be needed as the season grinds into November. This was arguably the best we’ve seen NU’s offense and defense look collectively in a half all season. Credit Nebraska’s defense for the second straight year stepping up and stopping North­west­ern’s offense in the second half. The Huskers’ defense appears to be learning how to harness what was always some pretty appealing talent.